On January 29, 1737, Thomas Paine was born in Thetford, England. His father, a corseter, had grand visions for his son, but by the age of 12, Thomas had failed out of school. The young Paine began apprenticing for his father, but again, he failed. So, now age 19, Paine went to sea. This adventure didn't last too long, and by 1768 he found himself as an excise (tax) officer in England. Thomas didn't exactly excel at the role, getting discharged from his post twice in four years, but as an inkling of what was to come, he published The Case of the Officers of Excise (1772), arguing for a pay raise for officers. In 1774, by happenstance, he met Benjamin Franklin in London, who helped him emigrate to Philadelphia. His career turned to journalism while in Philadelphia, and suddenly, Thomas Paine became very important. 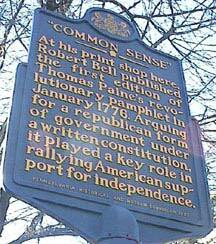 In 1776, he published Common Sense, a strong defense of American Independence from England. He traveled with the Continental Army and wasn't a success as a soldier, but he produced The American Crisis (1776-83), which helped inspire the Army. This pamphlet was so popular that as a percentage of the population, it was read by or read to more people than today watch the Super Bowl. Thomas Paine’s pamphlet supposedly sold 500,000 copies in its first year of circulation. Because Paine was intent in pointing out an alternative to British rule, he donated any royalties from Common Sense to George Washington’s Continental Army. He intended to assist the oppressed colonists and a fair and worthwhile cause, the American Revolutionary War. To the American colonists, Paine’s straightforward and simply-written expressions made political ideas real to the people. He targeted the deeply felt sentiments of the colonists, presenting reasons for breaking free in a manner that they understood. Common Sense made the war for freedom an individual choice, which could be attained in a united manner by the colonists.
. . . Mankind being originally equal in the order of creation, the equality could only be destroyed by some subsequent circumstance: the distinctions of rich and poor may in a great measure be accounted for, and that without having recourse to the harsh ill-sounding names of oppression and avarice. Oppression is often the consequence, but seldom or never the means of riches; and though avarice will preserve a man from being necessitously poor, it generally makes him too timorous to be wealthy. In the early ages of the world, according to the scripture chronology there were no kings; the consequence of which was, there were no wars; it is the pride of kings which throws mankind into confusion. . . . In the following pages I offer nothing more than simple facts, plain arguments, and common sense: and have no other preliminaries to settle with the reader, than that he will divest himself of prejudice and prepossession, and suffer his reason and his feelings to determine for themselves: that he will put on, or rather that he will not put off, the true character of a man, and generously enlarge his views beyond the present day. . . . I have heard it asserted by some, that as America has flourished under her former connection with Great Britain, the same connection is necessary towards her future happiness, and will always have the same effect. Nothing can be more fallacious than this kind of argument. We may as well assert that because a child has thrived upon milk, that it is never to have meat, or that the first twenty years of our lives is to become a precedent for the next twenty. But even this is admitting more than is true; for I answer roundly, that America would have flourished as much, and probably much more, had no European power taken any notice of her. The commerce by which she hath enriched herself are the necessaries of life, and will always have a market while eating is the custom of Europe. Alas! we have been long led away by ancient prejudices and made large sacrifices to superstition. We have boasted the protection of Great Britain, without considering, that her motive was interest not attachment; and that she did not protect us from our enemies on our account; but from her enemies on her own account, from those who had no quarrel with us on any other account, and who will always be our enemies on the same account. . . .
religious liberty from every part of Europe. Hither have they fled, not from the tender embraces of the mother, but from the cruelty of the monster; and it is so far true of England, that the same tyranny which drove the first emigrants from home, pursues their descendants still. . . . I challenge the warmest advocate for reconciliation to show a single advantage that this continent can reap by being connected with Great Britain. I repeat the challenge; not a single advantage is derived. Our corn will fetch its price in any market in Europe, and our imported goods must be paid for, buy them where we will.